← MUNGO MacCALLUM. Another fine mess the constitution has got us into. IAN MCAULEY. Can Labor hold its nerve on tax reform? Shorten has brought tax reform to the political arena. Let’s hope the Labor Party doesn’t go to water between now and the next election, because we need more public revenue and a fairer and less distortionary tax system. In his dispute with Bill Shorten over taxes Treasurer Scott Morrison is probably right when he suggests that Labor is proposing to raise taxes. The state of our public debate, however, is such that no party aspiring to office would explicitly state that it intended to raise taxes, no matter how strong the case may be. Our media suppresses any rational debate on public revenue. Murdoch’s media present any proposal to raise public revenue as an assault on hard-working and over-taxed battlers, an impediment to economic growth, and as a step on the path to soviet-style socialism. The more centrist media, while they may acknowledge the case for higher public revenue, suggest it is politically impossible – as if our country is incapable of structural reform. 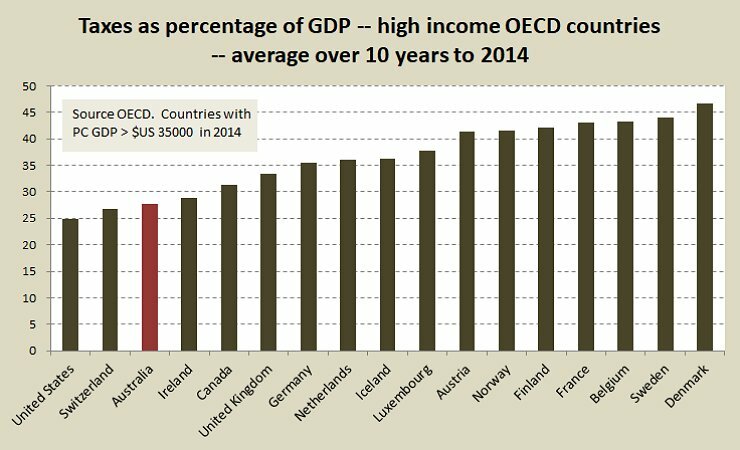 In fact, by the standards of other prosperous OECD countries, Australia’s taxation revenue is very low, as shown in the figure below. We’re down there with the two lowest-taxing countries. One, the USA, has crumbling infrastructure, grossly inequitable and expensive health and university education systems, a miserable social safety net, and a budget deficit to GDP ratio twice that of Australia. The other, Switzerland, does have high-standard public goods and services, but their statistics do not necessarily record a whole set of tax-like charges set at the canton level. Of course Australia can muddle through with low taxes, but to do so has net costs. The most obvious costs relate to the use of inefficient and inequitable private mechanisms to achieve what a well-funded public sector could do so much better. Toll roads, technical education and private health insurance are cases in point. Less obvious, but no less costly, consequences of low taxes are the much-needed public goods that never get provided – the things that even with the most elaborate public-private-partnerships or other incentives will never be attractive to the private sector. These include basic research in the CSIRO, interstate and outback highways and public health initiatives. More generally, Morrison’s assertion that higher taxes impede economic growth has no basis in fact. As Miriam Lyons and I have demonstrated in our book Governomics: can we afford small government?, there is no relationship between a country’s level of taxes and its economic growth. What counts is not the “size” of government as measured by its tax and public expenditure, but the quality and efficiency of its operations. Is it wasting money on a bloated bureaucracy or unnecessary military adventures? Is it using best practices in its health and education systems? Is it providing infrastructure where it is needed rather than in response to political opportunities? And so on. Contrary to some views pedalled by the anti-tax lobby, well-designed taxes can actually improve economic resource allocation. A carbon tax for example can help an economy make an orderly transition to a necessary low-emission structure, while accounting for the full resource cost of burning fossil fuels. By the same token badly-designed taxes can have adverse economic consequences. As a case in point, before 1999, when then Treasurer Peter Costello yielded to pressure from the financial sector, Australia had a non-distortionary capital-gains tax system. We therefore have capital-gains and personal income-tax arrangements that drive investors’ funds to speculation in housing at the expense of productive investment in new ventures. Shorten is rightly drawing our attention to basic inequities and distortions in our tax system. That majority of Australians who earn a living through wage and salaried employment and who have little capacity to accumulate savings are doing the heavy lifting, while those with high incomes have been given a suite of breaks allowing them to evade their responsibilities through concessions including family trusts, salary sacrifice to superannuation, and novated leasing for employer-provided cars. Those who benefit from such inequitable arrangements defend them on the basis that they constitute legal “tax-avoidance”, rather than illegal “tax-evasion”. But that’s to confuse what is legal with what is moral. It’s all “evasion” by the simple moral standard that we all have an obligation to contribute, within our means, to the collective good – to our common wealth. Shorten’s very mention of family trusts, however, has raised squeals of protest from those who would have us believe that “small business” carries some self-evident public benefit – so self-evident that its case for privileged treatment doesn’t even have to be articulated. We should be clear what “small business” means. It certainly includes struggling family farms and those small shops owned by families of Greek or Vietnamese immigrants – some of whom are probably small-time tax evaders running cash operations out of sight of the ATO. But it also includes huge agribusinesses and car franchises, whose proprietors would be enjoying $500 000 plus incomes. As the Australia Institute points out they are by far the main beneficiaries of family trusts. While family trusts and rorts for housing speculators are clearly in Labor’s mind, they would do well to consider other ways to make our tax system fairer and less distortionary while raising public revenue. While the government has closed off some of the most egregious concessions for so-called “self-funded” retirees (they are actually funded from years of tax breaks), this group is still in a highly privileged position. There is also scope for re-introduction of inheritance taxes, for higher taxes on gasoline and diesel (while reducing car registration fees), and for abolition of breaks for novated leasing. There should be a proper resource-rent tax: rather than running scared Labor should recognize that the stridency of the Mineral Council’s campaign a resource-rent tax provides strong evidence that such a tax is needed. Just as the foreign-owned mining companies had a great deal to lose, so did the Australian public have a great deal to gain, but the Labor Government in office at the time didn’t even try to re-frame its argument in terms of public benefit. Other measures to improve the integrity of our tax system include reform of temporary visa programs to ensure students, young people on working holidays and other temporary foreign workers are not forced into the black economy, and a phase-out of notes and coins as tender. Such measures would not kill the black market, but they would shrink it and make the system fairer on those businesses who do abide by the spirit and the letter of the law. Shorten, to his credit, has put tax reform firmly on the political agenda. Will Labor stick to its principles, or will it lose courage as greed and self-interest raise their voices as the next election approaches? Ian McAuley is an adjunct lecturer in public sector finance at the University of Canberra, a fellow of the Centre for Policy development, and the author of several papers on taxation, including Taxes – our payment for civilization prepared for SACOSS. One Response to IAN MCAULEY. Can Labor hold its nerve on tax reform? A very useful and timely contribution. Perhaps it is time for Labor’s leadership to argue the case for the social and economic benefits gained from taxation. It is well past time for the assumptions behind the Less Tax is Better mantra to be shown as baseless articles of faith. We need to take a hard look at what sort of future we want before we head any further down the road we are on. That will be difficult given the strident articles of faith doled out in the press and on TV, but it is worth the effort and stands a chance of succeeding in the light of people’s lived experience.